Do some types of back fusions have better long term results than others? Unlike medicine in general, surgical procedures tend to evolve from more invasive to less invasive, and spine surgery is no different. Surgeons love to tout their use of less-invasive techniques. We’re now seeing more and more percutaneous fusion systems, where screws are placed through the skin using a specialized kit of tubes and reamers or substances are injected between vertebrae to “fuse” them together. The problem is that a fusion by any other name is still a fusion, with all the fleas that are associated with fusion surgery—most importantly, adjacent segment disease. There are new types of Back Fusions popping up regularly. This recent study is one great example of how percutaneous fusion, which injects a cement-like substance (polymethylmethacrylate) between two vertebrae (they call this one a PIPI procedure), seems to improve back pain for up to two years. I can almost guarantee you, however, that like other fusion systems, as time went by, the fusion likely overloaded the adjacent segments and these patients ended up with new problems. Let me explain. The back is made up of 24 movable vertebrae, or back bones, that run the length of the back (called the spinal column) from the neck all the way down to the lower back. A disc sits between each vertebra, and every two vertebrae come together in the back at a facet joint. The spinal cord, a big bundle of nerves that transmits feeling and tells our muscles what to do, is protected between the vertebrae and the facet joints. The entire spinal column is held together by ligaments and kept stable by a series of muscles called multifidus, and it has natural opposing curves to distribute our weight and provide stability. Each segment of the spine is designed the way it is designed so it can move. 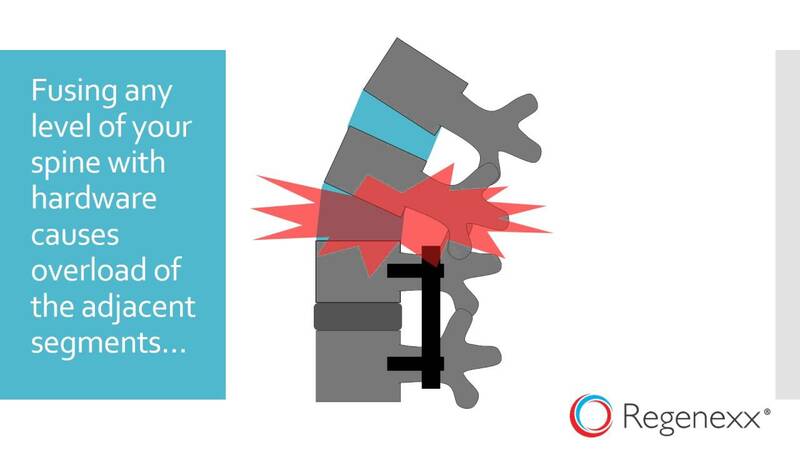 When two vertebrae are fused together, it limits that movement our spine was built to have. So you might say, “What’s two vertebrae? I have twenty-two more.” But the problem doesn’t stop with two vertebrae. Fusions can also lead to pain and adjacent segment disease (ASD). In all types of Back Fusions, no matter how invasive, or non-invasive the spinal fusion is, a fusion is a fusion, and its intention is to stop the movement between vertebrae and eliminate further damage to that segment of the spine. However, this puts more stress on the segments above and below the fusion and this overload can cause damage in those areas. This is known as adjacent segment disease, and, predictably, surgeons will likely want to go in and fuse these segments as well. So two fused vertebrae become three or four or more over time. Learn more about ASD by watching the brief video below. A new high-level study published in the prestigious New England Journal of Medicine (NEJM) showed that fusions may be on the way out, as they failed to show any clinical value and added that a fusion surgery didn’t improve outcomes at two or five years after surgery! An article on low-back-surgery success rates I posted in 2013 looked at a study that showed that the more levels you fuse, the more forces you put on the segments above and below the fusion. It’s not just the low back that surgeons like to fuse. They also like to “fix” the neck curve with a fusion. What happens when you lose the normal neck curve? The head comes forward, and it takes more energy to hold it up. The head’s weight gets forced on the discs, which can begin to fail over time. Research has shown that disrupting the normal neck curve, such as is done in a fusion, can lead to neck pain. The upshot? If you’ve already had a fusion, your resulting ASD can likely be treated with advanced interventional orthopedics. This involves precise placement of your body’s own stem cells and platelets to help the ligaments, muscles, joints, and nerves above and below the back fusion. If you haven’t had a fusion but are considering one, percutaneous or otherwise, please consider stem cell or platelet treatments to see if they might be a good solution for you. The important take away is that all types of Back Fusions have the same long term problems. Signing up to undergo a procedure that will limit or disrupt your normal movement leading to more pain and damage in the long run, simply isn’t wise. What would you suggest for me? My disk between L5 and S1 is gone! It used to be bulging on both sides, more on the right than the left. But now it is gone, and of course, sitting on the nerves which are causing my legs to - long story short - not work right. I have been searching for some sort of disk replacement, but I haven't come across anything that I would want in my body. Great idea to avoid random spare parts! Severe L5/S1 issues are not uncommon for us to treat, please see: http://www.regenexx.com/one-year-post-op-on-a-low-back-disc-bulge-treated-with-stem-cell-injection/ and http://www.regenexx.com/disc-stem-cell-injection/ To see if we can be of help in your particular situation would require a Candidacy Evaluation, so we could review MRI's, take a medical history and, based on our experience determine whether you'd be a good, fair or poor Candidate. so I'm 16 weeks post op on a l5-s1 fusion. I'm having pain in my right si joint. I know its due to the increased stress on the joint from the fusion. What options do I really have?